The Moray Firth dolphins are one of Britain’s greatest wildlife spectacles. This lavishly illustrated book gives an insight into their world and that of the other marine mammals living in the beautiful Moray Firth. By Tim Stenton. Published by Bassman Books, 104 pages, 170 photographs, paperback, £9.99. 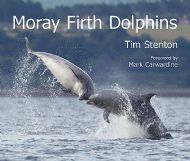 Moray Firth Dolphins is on sale in: Cromarty – The Emporium, Post Office, Ecoventures; Dingwall – Picaresque Books, Dingwall Museum; Inverness – Waterstone's; Rosemarkie – Spar; Spey Bay – Whale and Dolphin Centre. Or use the buttons below to buy with PayPal or credit card.